Have you been before in a deep sea fishing trip? If not, this is the right moment to plan a trip, because you can practice this sport in some of the most wonderful destinations of the world. When it comes to planning this type of trip, you should make sure that your rent the boat charter in time, because you will find difficult to find something when you arrive in Turks and Caicos. 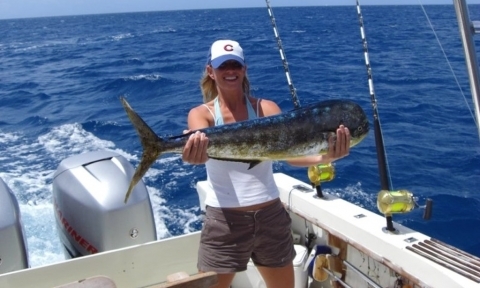 Everyone is travelling here with the purpose to try deep sea fishing, and people book the boats with a long time before they arrive. If you have never rented one before, here is what you should expect when you arrive on one of the boat charters in the Turks & Caicos Island. For making sure that you know what to bring you should contact the provider, because they will offer you all the information you need. What things should I bring with me? It is important to bring your fishing license, because it may take a while to get one while on the island, and you do not want to waste your time. In case you do not have one, you have the possibility to purchase one online, make sure to check the requirements. Also, if you are the type of person who is used to pay via card, you should know that you will have to bring cash, because you will have to pay for the items you will use on the boat, as the galley purchases, fish cleaning and gratuities. Make sure to put in your pack sunblock, because the sun shines bright off shore, and you will have to protect your face, ears and neck. Do not forget your glasses and seasickness medication. The provider of the boat charter will not allow you bring alcohol on board. Therefore, you should leave it at home. Also, it is forbidden to bring illegal drugs, because they can have a negative impact on your health while on the sea. Do not bring fireworks and weapons with you. For any other questions you should ask the provider of the charter, because they will offer you all the information you need. When you get on the boat the first thing you have to do is to find a place where to put your things, because they have to stay out of the way of the other passengers. Also, you will have to make sure that you carefully listen to what the crew and the captain have to say, because they will provide you useful details on how to stay safe while fishing. In case you prefer to fish with live bait, then you will have to remember to change it often. The right attitude is essential, because you have to be aware that you will not be able to catch the biggest fish from the beginning, and it requires experience and patience.